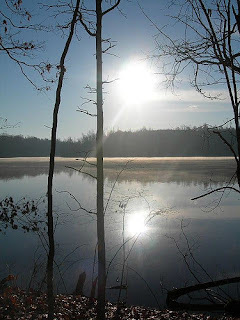 I'll be heading over to Winston Salem in the morning for my first event of the year, The Salem Lakeshore Frosty 50K. This year promises to be the "not so frosty 50" with the high tomorrow approaching a record mid 70's . In the past it has been below freezing the whole day, low 60's one year and a couple of years have had snow and ice. The course is a double out and back around Salem Lake on a dirt road and a paved greenway. 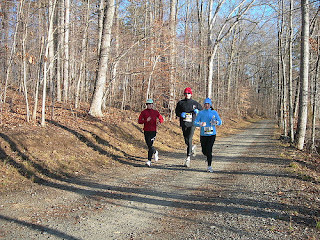 I ran this for the first time back in 2003 as my 2nd ultra and my 4th race over 20 miles. The course is relatively flat so I went out too fast and suffered the last 7 miles. Each year afterwards I would always use this race in an attempt to improve my 50K pr and was successful the next two years in doing so. 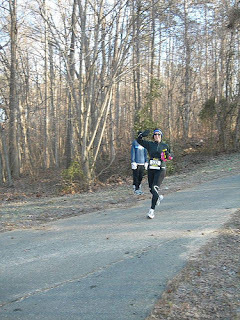 This year looks to be the biggest field of runners ever as ultrarunning continues to grow in the area. Looking over the entrants list I see so many friends and familar names. There are a couple of people that I met for the first time at this event in past years. That is Dale Tiska in the red jacket running on the dirt road. I don't recognize the other two but if anyone knows who they are let me know. Thanks to Ben Dillon for the photos from last years race.